We here at Jaydeep Steel, are well-known as Brass Pipes & Tubes Supplier, manufacturer, and stockists, both in India and worldwide. 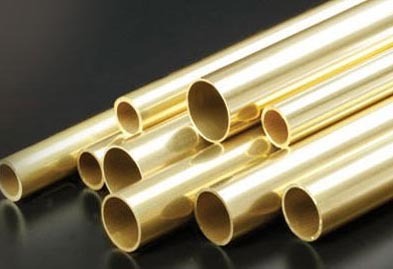 Brass Pipes are suited for numerous commercial/industrial works like manufacturing of Pipe Fittings, Furniture manufacturing, grill architecture, General Engineering Industry, Imitation Jewelry, & Lighting Fixtures. Brass Tubing is ideal for standard pipeline and heat exchanger applications. They are available in various grades such as C230, C260, C330 and many more with customized sizes, the wall thickness at most competitive prices. Brass Seamless Pipes & Tubes are manufactured by extruding the brass metal to the desired length and do not have any forged or welded cross-section throughout their length. These tubes contain thread at any one of either end. Brass Welded Pipes & Tubes are produced from a strip that is initially roll formed and then welded into a tube or pipe, as per the need. These are less expensive and are readily available in long continuous lengths at our center. Brass Cold Drawn Pipes & Tubes are manufactured by rolling the pre-annealed brass alloy at a cooler temperature. This process results in the creation of a much stronger and harder metal. Brass Electropolished Pipes & Tubes have improved micro-finish that enhances the functionality and aesthetics of the part, and are more corrosion resistant. 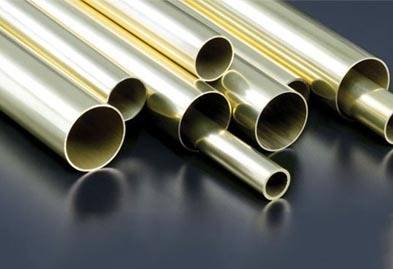 At Jaydeep Steels, Brass Pipes and Tubes are available in Shapes like Round, Square, Rectangular, Hexagonal, Hollow, Oval etc. Call us now to get a free and quick quote immediately. Jaydeep Steels stocks a wide range of materials and grades. Below are a list of all standard brass pipes and tubes materials and grades we stock. Our experienced team of metal experts will get you the metal you need when you need it. Call us today for your Brass Pipe & Tube Needs!